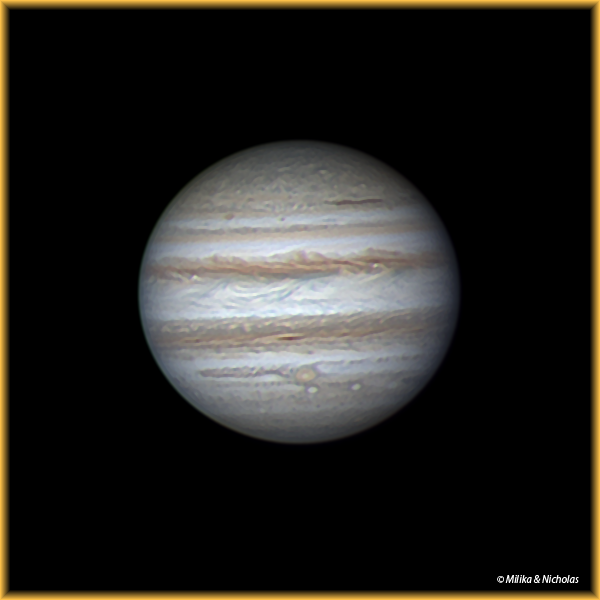 They are easy objects to see even in a small telescope as they flit back & forth around Jupiter, often crossing in front of the planet...& then their small disks (even in small scopes they appear as such) with their dark shadows trailing behind (or ahead, depending upon from which side the sunlight is coming from!) creating regular "eclipses" across the Jovian surface. Note: Most of the images on this page are "clickable" and will open up as "full scale images" in a new tab. Jupiter is one of the "Gas Giants" but its gravity is such that the gases at the core of this planet act in many ways like metal, such is the extreme pressure therein...& around this giant planet there is a magnetic field nearly 20,000X that of Earth's. 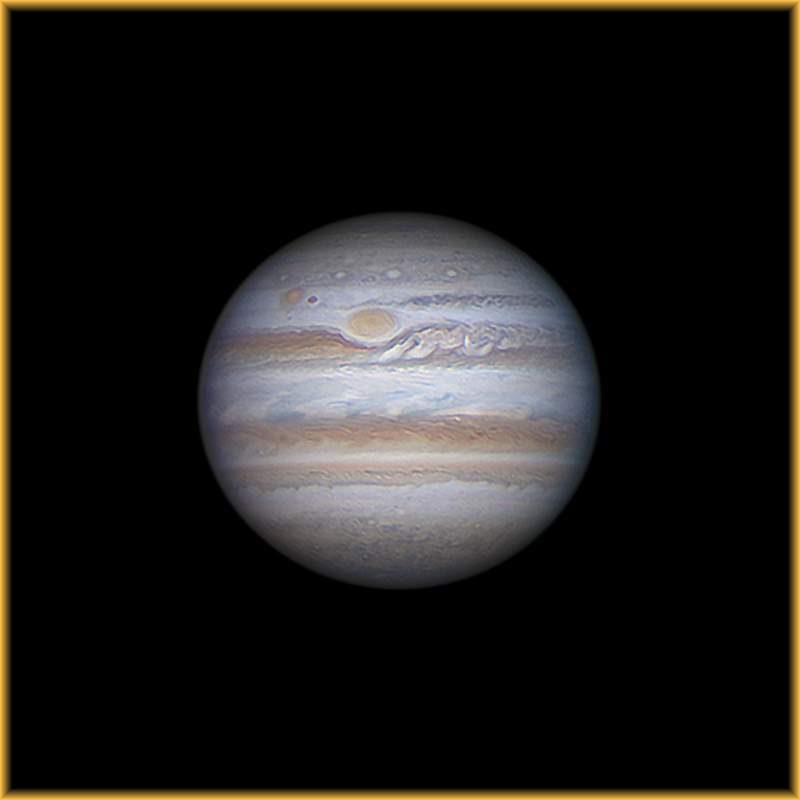 The magnetosphere of Jupiter, which is composed of this field as well as extremely high radiation levels swells out from the planet some 600,000 to 2 million miles (1 million to 3 million km) toward the sun and tapers to a tail extending more than 600 million miles (1 billion km) behind Jupiter...! 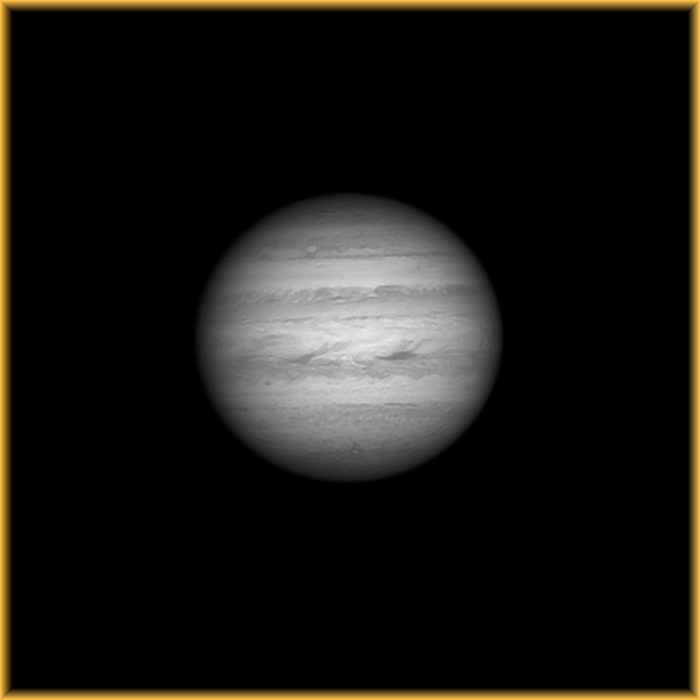 The planet's gaseous nature provides a truly spectacular view in a telescope from down here on Earth...Jupiter is the planet where we see the ever-changing extremes of raging storms & other weather systems interacting constantly, the different & more denser compositions of gases from layers below the surface being constantly dredged up or intermingled/exchanged with the surface/cloud top compositions to create amazing panoramas of colour & intricate, changing patterns..! 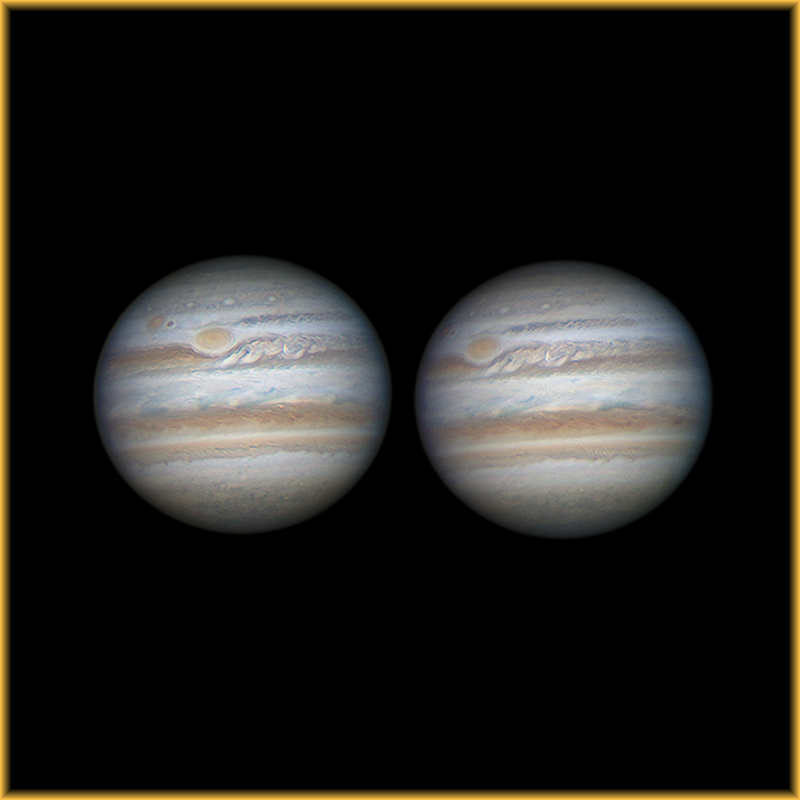 No general description of this planet's appearance would be complete without mentioning the "Great Red Spot" or "GRS" - possibly first seen about 350 years ago, this gargantuan hurricane-like storm is approximately 3X as wide as our Earth across its width. This feature, whose colour fades & then intensifies over time spins at about 350kph counter-clockwise around its centre. 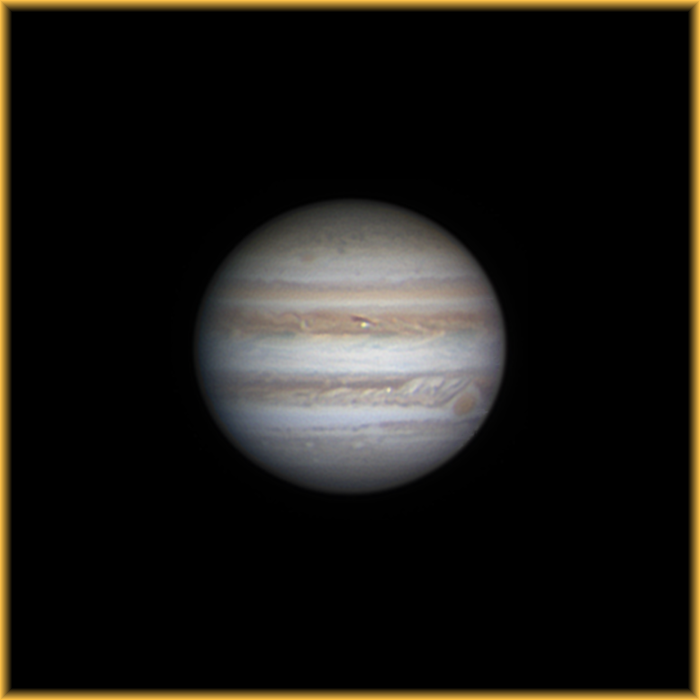 One of the few reasonably successful colour (rgb) images we managed of Jupiter this year, again at that low elevation of 38°...we can see the Great Red Spot (GRS) sitting part-cradled in the SEB & rotating out of view on the far left of the disk. This infrared image displays some nice detail on Jove, the dark thin ribbon-like "extensions" from the 2 dark belts (the SEB & NEB) that protrude into the bright central band (the "Equatorial Band/Zone" or "EZ") like threads or tendrils are termed "festoons". 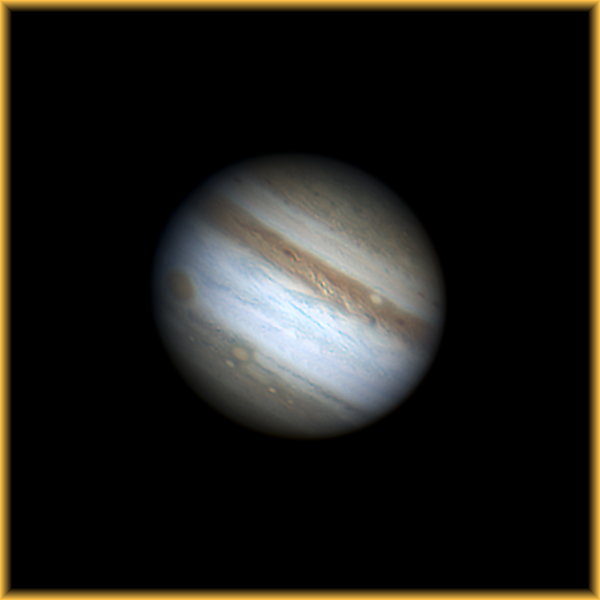 Another "passable" rgb/colour image for the low elevation - one of those long "tendrils" mentioned in the preceding image is very long in this image! 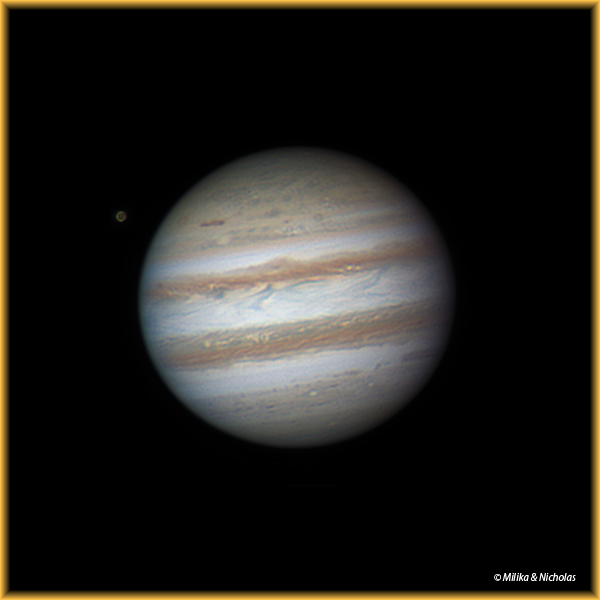 Another Jovian/Galilean moon event, again featuring Io passing in front of (transiting) Ganymede. 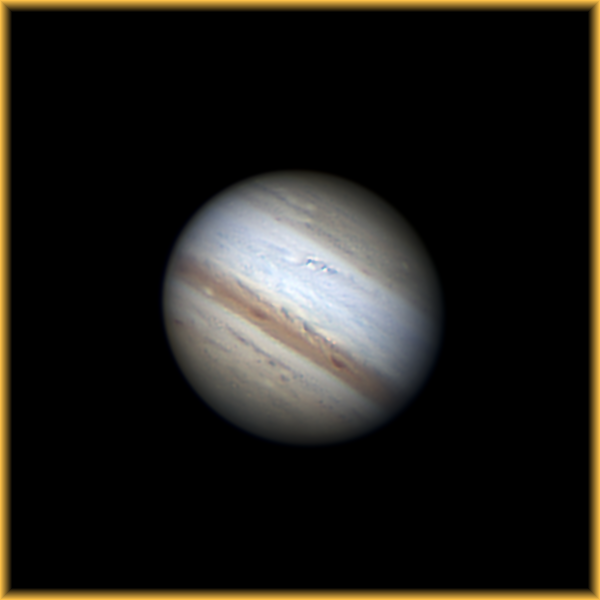 But this time Io (the smaller moon) passes across Ganymede more fully than in the image before where it just "grazed' the lower section of Ganymede: here the animation is a more "close-up" view than the previous one. 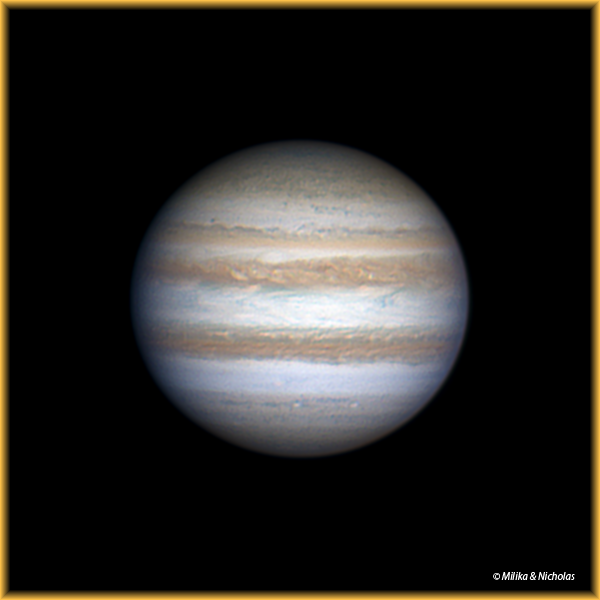 We wind back the clock over 2 years to an image where Jupiter is a little higher in elevation in this image...we had travelled a fair distance North to try & achieve the better imaging possibilities here although Jupiter was still only a few degrees above 40 degrees elevation. 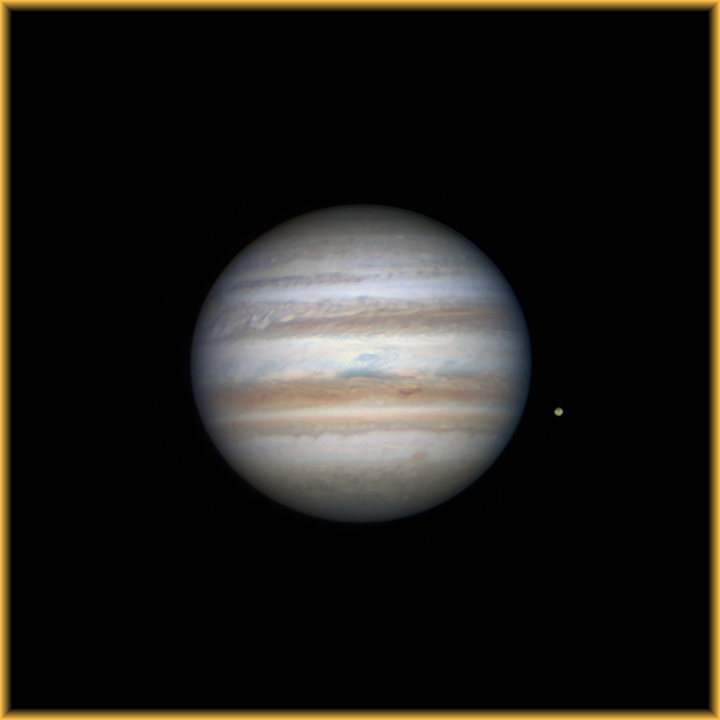 Regardless, this image was still quite pleasing as not only the GRS was visible but one of Jove's large moons (Io) can be seen on the left crossing in front of the planet's disk with its black shadow trailing along behind...if you realise the direction of the sunlight is coming from the left you will understand why the shadow is far to the right of the moon itself! :) Also, you will notice that Io has a very dark "top & bottom" due to the fact that the poles of this moon appear very dark in comparison to the rest of the moon's disk. 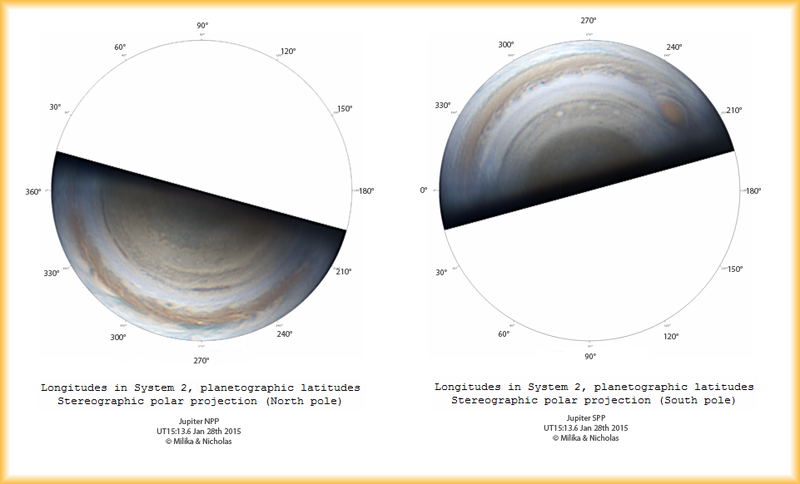 Back to even lower elevation down South than Jupiter is in 2015...30° actually - but for the elevation a reasonable outcome with the GRS visible. 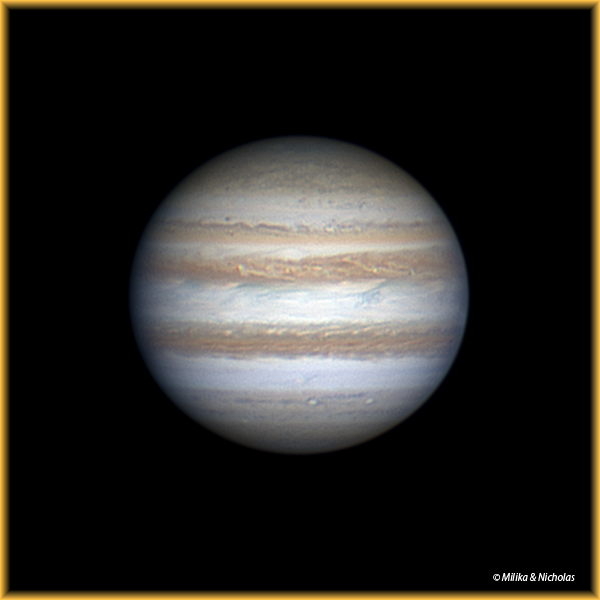 Taken at 28° there is still a wealth of detail in this image...the festoon/"tendril" reaching out from one of the dark belts looks almost like a claw (seen in the image above also) whilst down towards the bottom of the disk are 2 circular white spots, polar storms. Incidentally the "Wet Season" was unleashed this particular night - luckily after a couple of hours of imaging Pat noticed a large cloud-bank building up from the south-east & we hurriedly packed & covered everything up...the subsequent thunderstorms & rain was the heaviest we have ever experienced in our entire lives..! 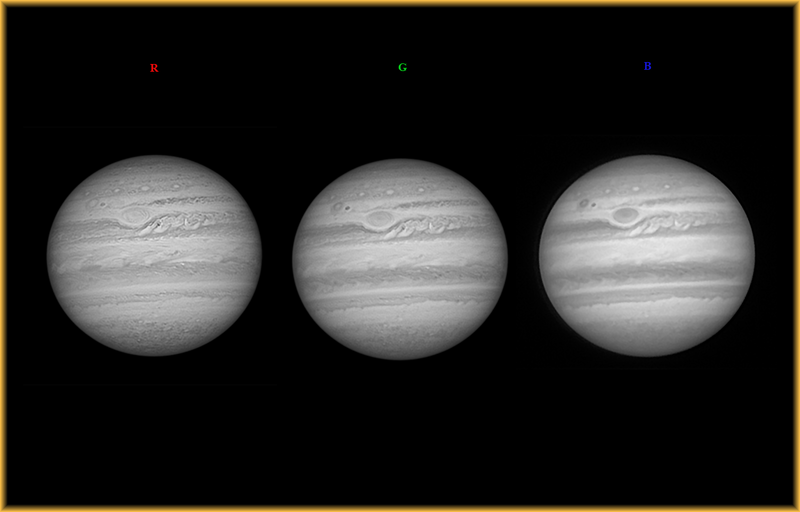 Here are the individual channels for the rgb/colour image above - notable in that the blue channel was pretty reasonable. 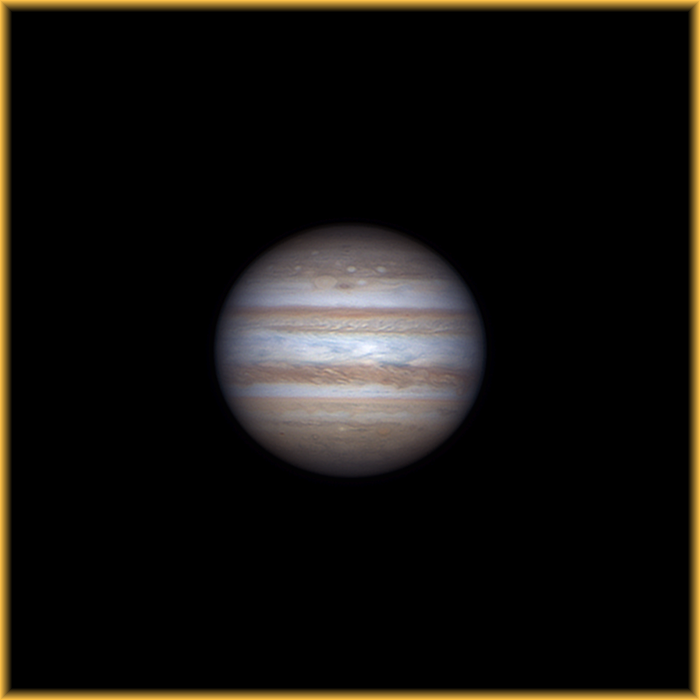 You will notice that in this image of Jupiter there is only one dark belt/band instead of the usual 2...these 2 dark bands are the NEB (Northern Equatorial Belt) & the SEB (Southern Equatorial Belt) except in this image the SEB is missing..! However, if you look where the SEB is normally situated you will see that in the blue/grey/white space there are a couple of darker "squiggles" - these markings/details are important especially when viewed alongside the next few images below this particular one! These "squiggles" are in fact the first signs that the SEB is starting to reform after having gone missing for some time..! It is in this particular area that what is termed "an SEB revival" has started. Interestingly on examining this image I realise that a very similar vista is presented here to the image above...2 weeks earlier here & "less-rotated" than the one above - rotation is from left to right in these 2 images - but there does appear to be some dark detail in the same position that heralded the SEB revival in the image above - perhaps an earlier indication of this "revival" is shown here..?!? 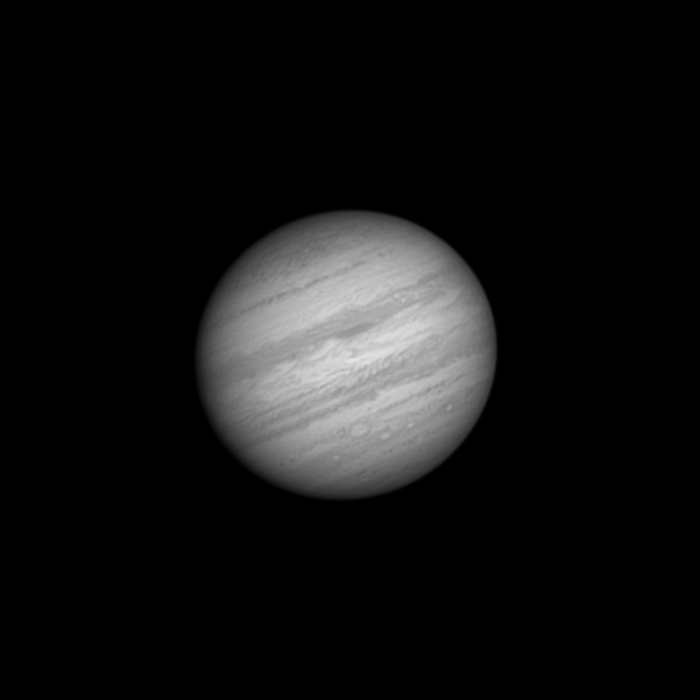 Here are 2 images side-by-side, taken 10 days apart: the image on the right is a colour/rgb image of the red channel mono image directly above. 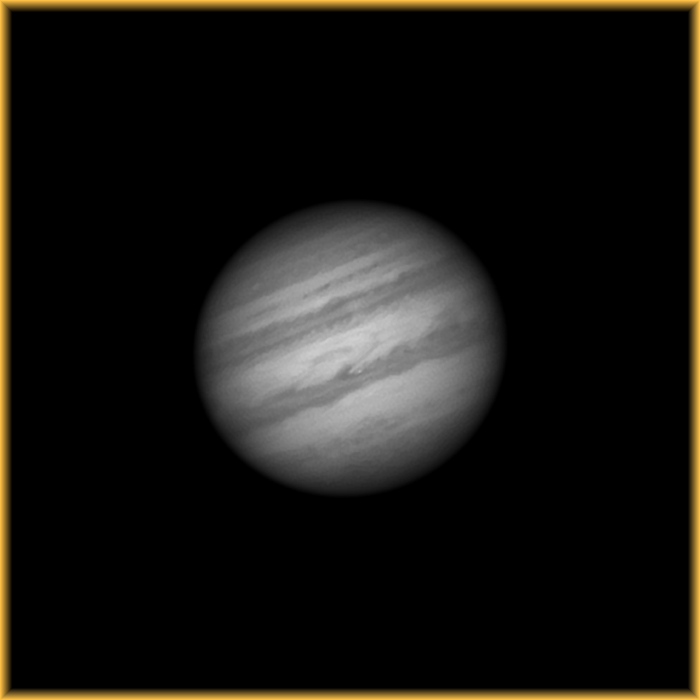 This is one of the very first images of Jupiter we ever captured –albeit with a smaller telescope & (much) inferior camera: back then (2009) Jupiter was much higher in the sky than it is now before it started on its’ regular journey North where it has been for the last few years.